This machine is used to make steamed stuffed buns with different stuffing. Two hopper,easy maintenance and easy operation, high automation and position accuracy. 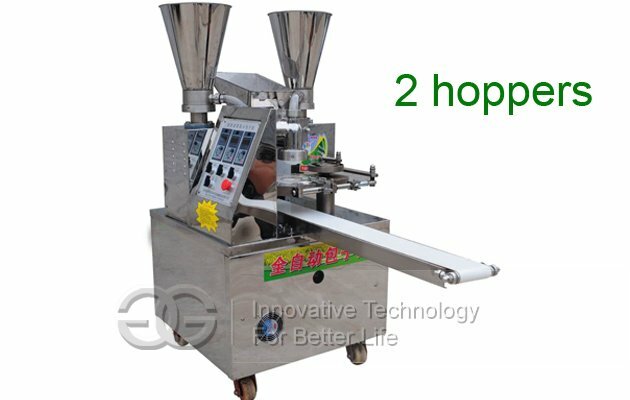 This two hopper automatic steamed stuffed bun making machine can be customized for 110v or 220v. Output can be customized, size of steamed bun also can be made based on requirement. This machine is also called momo maker. This machine has high automation, efficiency equals to efficiency of dozens of workers manual making. We can make small steamed buns, soup bags, meat buns, steamed buns, etc. The popular design is simple, made of high quality stainless steel, with fine appearance, strong durability and good practicability. Our company is a professional stuffed bun making machine(also named baozi machine) manufacturer, the production strength is strong, the majority of customers can visit the field, and pay after the satisfaction. 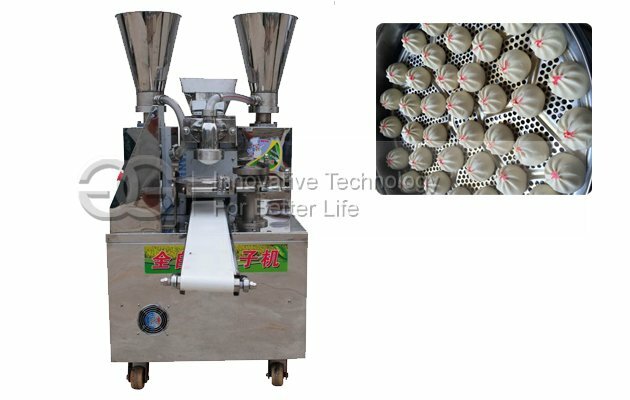 We have our own production core technologies and personnel of steamed stuffed bun machine, product constantly upgrading, so as to develop and produce different models machine for the masses of customers: GG200A type, GG200B type, single or double stuffing hopper steamed stuffed bun machine. 1. This machine is equipped with improved head, double frequency, more stable performance. 2. Multifunctional steamed stuffed bun machine has advanced flour conveying and stuffing feeding system, fully protecting the taste of flour, truly not to hurt the flour, ensuring the texture of steamed stuffed bun, stuffing feeding smoothly, uniformly, every kind of fillings can make the steamed stuffed bun forming effect excellent. 3. Steamed stuffed bun machine in accordance with the requirements of the scientific design of pasta crafts, to ensure that product density, has guaranteed the product porosity of uniform fine, elasticity and water holding is perfect and the product surface is bright and smooth, pattern neat, smooth taste, far more than handmade steamed stuffed bun. 4. Uses the human nature control panel, high quality microcomputer control, the control is accurate and reliable, 5 minutes can freely operate. 5. High degree of automation, quantitative and accurate, consistent with the size of the product, the proportion of skin stuffing 20 grams -150 grams, optional adjustable, 1-2 people can operate. 6. Product diversification, can produce a variety of buns, pumpkin cake, dumplings and other pastry products. 7. Light weight, the main parts are made of stainless steel, beautiful appearance, consistent with national food hygiene standards. 8. 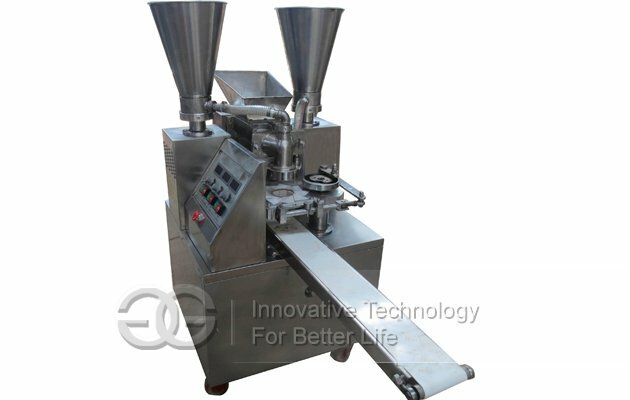 With reasonable structure, molding, stuffing feeding, flour conveying and control board are independent motor drive, not easy to happen with joint and several faults, and convenient maintenance and cleaning. 9. 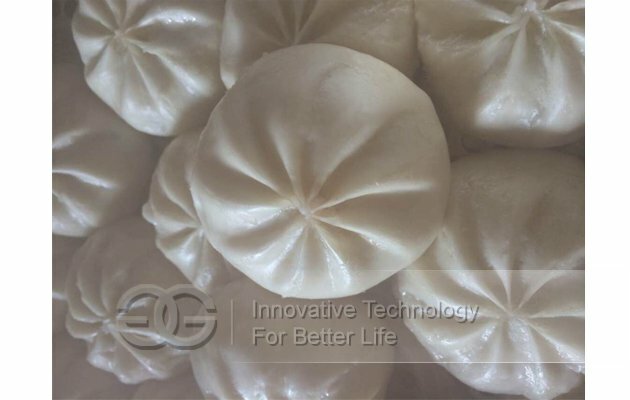 Steamed stuffed bun machine work efficiency is equivalent to 8 to 12 workers at the same time hand-made steamed stuffed bun, real low input, high efficiency. What is the voltage/phase for this steamed bun making machine?